Forex White Label programs are beyond popular these days. As the number of traders worldwide keeps growing further and further, so does the number of forex brokers. This market is still far from it’s saturation point, but the competition is fierce and earning trust of forex traders is a complex process. If you want to start a Forex white label business and make money from it, you need to act smarter than your competitors. Offering more advantages and more value to your customers along with more effective promotional efforts will put you on the road to success. What traders are looking for in a broker or a forex white label partner? First of all, let’s talk about value. No matter how good your PR campaign or team is, they need a good product to promote. How can you stand out from the crowd in this niche? Let’s face the fact that as a new forex white label partner you most likely won’t be able to offer better spreads, more flexible plans or more reliable trades execution. Besides, almost every broker emphasises these key features in their marketing campaigns and almost no trader pays attention to those standard phrases as they hear them way too often nowadays. Convenient service packed with modern features are a lot more important than spreads. While Forex market is crowded with brokers, only small part of them has social trading feature. Yet, social trading, or copy trading, is one of the strongest trends in this niche. It may be hard to find a forex white label program that comes with copy trading platform, but there is an easy way to connect such platform manually and start making money from both: brokerage and social trading. Jivestor offers a social trading platform that can work with a lot of different brokers as well as independently. Social trading white label solution is designed to meet the needs of brokers, introducing brokers, investment firms, financial websites and entrepreneurs. This is one of the most advanced and feature-rich social trading systems and it can come 100% white labeled and prepared for a smooth integration with an existing forex white label platform. 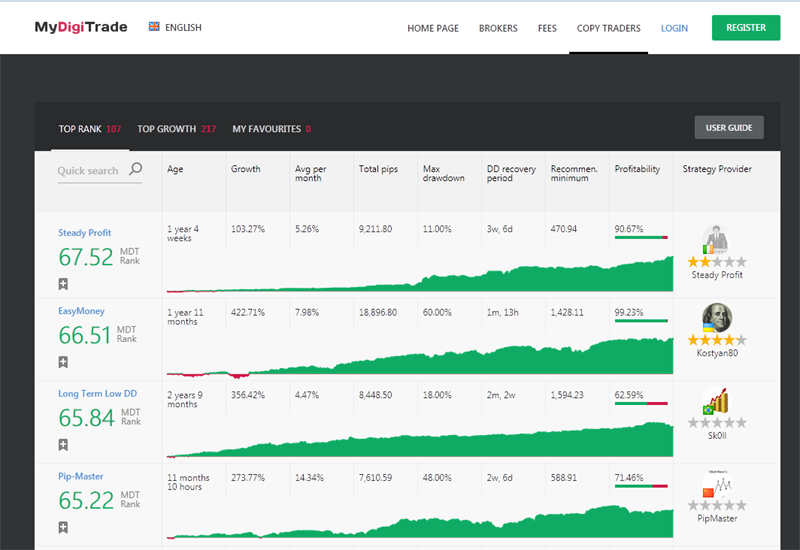 Jivestor offers a clean modern interface with lots of visual data for analysing and copying trading strategies. Good-looking charts and intuitive navigation will attract new traders as they are easy to understand even for complete beginners. Seasoned social traders will appreciate flexible options for following strategies, such as custom stop loss and take profit levels, precise slippage control and inverse copying. How to start a forex white label business with minimum expenses? Starting an independent brokerage on your own is a hard work that requires a team of dedicated professionals. To reduce the size of initial investment and simplify this process, you may choose to start as an introducing broker at first. Introducing broker partners with large brokerage company and only deals with clients. In this case all financial and back office operations are handled by the large broker (clearing firm), while the Introducing Broker needs to find a way to attract new clients. Becoming an Introducing Broker (IB) is free, as the IB and the parent company share profit from clients, attracted by the Introducing Broker. If you choose to be an introducing broker, you can increase your profit by partnering with a social trading platform. Adding Jivestor software to your IB platform will help attract additional clients, reach out to audience without any Forex experience and revive inactive accounts of your existing clients who lost money on independent trading. Social trading is an attractive feature for people who are not confident enough in their own trading skills, but still want to make money on financial market. 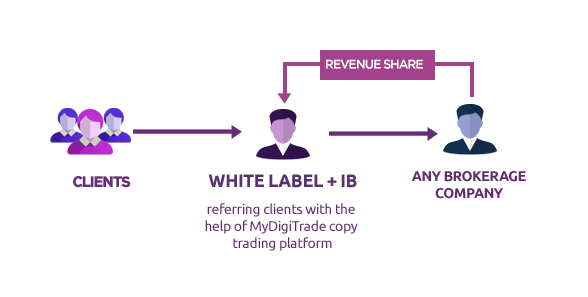 With a copy trading service connected to your platform you can convert visitors into traders a lot faster. Moreover, a copy trading service has proven to encourage clients deposit more money and trade more frequently. If you choose this business model, you can get in business faster, and then when you acquire enough clients, become a regular broker. How to promote forex white label brokerage? There is too much of everything in the global web, so building a website and waiting for customers to find you is a recipe for failure. Although reaching your target audience may seem quite a problem, there are many free and paid ways to do let people know you exist. Consider using several of the methods listed below. Strong social media presence. Building a helpful Facebook group, where people can chat about their trading experience, helps a lot. But it’s also wise to be present on all popular social networks, including Google+. When someone searches your website, these profiles will also pop up in the search results. Tutorials and webinars. This is very similar to content marketing, but brings much better conversion rates. When you host a webinar, you are talking to people who are already interested in your services and are ready to listen. Now your goal is to show them ways to make money on forex, of course with the help of your software. To maximise conversions consider offering an incentive at the end of your webinar, such as a bonus for attendees that will expire within 24 hours. This doesn’t have to be a money-bonus, an in-depth advise or a secret trading strategy will often work. Remember that people browsing the internet are complete strangers, and they don’t care about your business just yet. That’s why they are more likely to sign up for a freebie that offers something for them, such as a winning forex trading strategy or a step-by-step trading tutorial, rather than to spend their time creating an account with “just another broker”. During the webinar you will have subscribers attention for 40 minutes or 1 hour (or even more if you choose to) and that is the perfect opportunity to explain to them why your Forex website deserves their trust and matches their needs best (but make sure you also provide useful content to build trust instead of simply trying to sell your services). Creating a webinar requires initial efforts, but then you can repeat it over and over again to get more people on board. Once you have prepared a webinar, you can start promoting it using all the methods mentioned above. Starting a forex white label business is an interesting journey where success depends on your ability to provide high-quality customer service and attract the right kind of customers. How well do you know your customers? For example, if you are targeting novice traders or traders who lost their money previously with other brokers, having a reliable social trading system will give you a great advantage over your competitors. Jivestor Copy Trading is attractive because it works with many brokers and lets people assign the responsibility of their money management to someone else, and do it for free. Experiment with all kinds of marketing efforts, but make sure to measure results at every step. The recipe for success is simple: find out what works and stick to it.